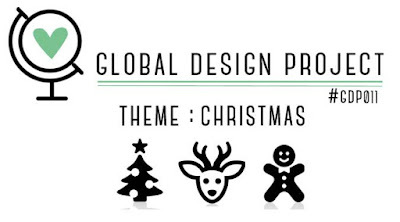 This week's theme at Global Design Project is Christmas! Definitely my favourite time of the year. Summer weather and long school holidays and time spent with family and friends. Not to mention a great opportunity for crafting! The paper for the Christmas trees on these tags was created using reinkers and water spritzer on a sheet of plastic. The vanilla cardstock in then placed on top of the ink pattern, press down, peel off and allow to dry. I then cut them out with the perfect pines framelits, covered with crystal effects and a little glitter sprinkled on top. 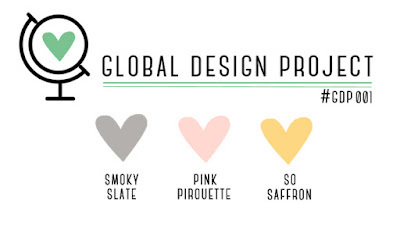 Ink: cherry cobbler, old olive and daffodil delight reinkers. Gold and silver encore. Whisper white craft and cherry cobbler. I loved the layout of this card and the colours, but just made a few changes to create my own Christmas card. 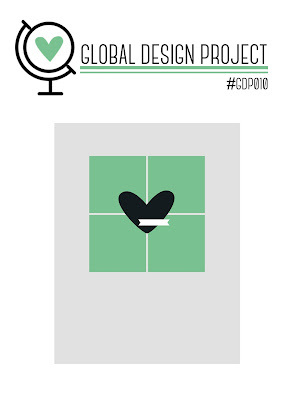 This week's challenge at Global Design Project is to CASE one of the designers cards from a previous challenge. 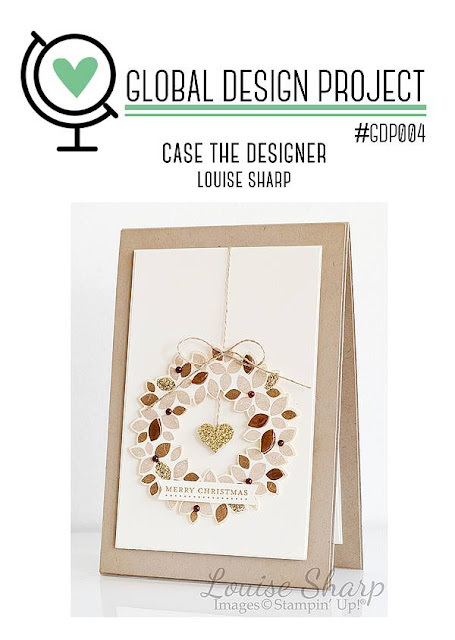 The card chosen is by Louise Sharp. The idea is to draw ideas from the card and then make it your own. I decided to go with the neutral colours and the Christmas theme, but I really wanted to use my new Christmas stamp set from the holiday catalogue. My first Christmas card made this year using the sketch challenge from Global design Project. Only about another 40 to go!! Unfortunately, I was too late to enter this week's challenge but I still wanted to show off the card. Accessories: Wondrous wreath framelits, wild wasabi thick baker's twine (retired) and gold foil. 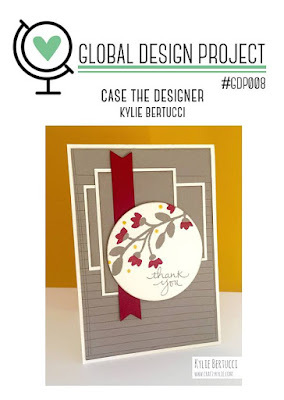 Global Design Project is a new challenge and design blog featuring Stampin' Up! demonstrators from around the world! 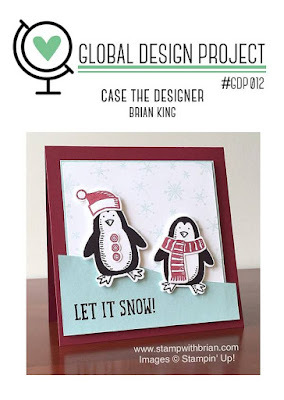 Each week brings a new challenge and fabulous cards and projects from these leading demos, some of whose blogs I have admired and visit regularly. I didn't have any dsp featuring these colours, so I made my own using the spot splatter from gorgeous grunge and the 3 colours featured. I did a half sheet of A4 so I have enough left over for another card. 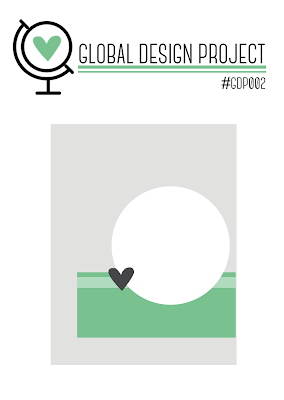 I am looking forward to each week's challenge and inspiration from the design team. I hope to participate regularly. Just back from a fabulous weekend away with crafty friends, Fiona, Amanda, Tania, Sharon and Ruth. We had a lovely time chatting, crafting and just enjoying a bit of time for ourselves away from the pressures of family and work. The card and matching gift box above are what we all created Saturday afternoon. We used the new thick white cardstock for the card base, it is so much more stable than regular cardstock. Just Add Ink have a colour challenge this week. It has been a while since I have had a chance to do any challenges but these colours really appealed to me so I wanted to have a shot at it. This card turned out nothing like I first imagined in my head! I originally did a sponged/watercolour background on the white card, but it turned out a bit too much colour so I ditched it. I was then going to use a number of bigger butterflies, but didn't like that look either! What I was left with was clean and simple with lots of white space! This week's challenge at Just Add Ink is colours, which are pink pirouette, night of navy and gold. The gold embossing of the corner garden stamp shows up so well against the dark of night of navy. The new catalogue is finally here. It is packed full of new stamp sets, new colours and accessories. Make sure you take a look either on the Stampin' Up! website (click on the catalogue in the right hand column) or on my online store site. Look what I have!! New catalogues and products. Stamps, incolours, ribbons and even a punch!! If you want to get your own copy of the catalogue, then book a seat for my Launch Party. We will be having afternoon tea and making something using new products for the catalogue. Each attendee will receive a free copy of the catalogue and a sample of the new in colours. Just add a comment or send an email and I will add you to the list! I made this card for one of my favourite facebook groups Aussie Crafters as part of the April Snazzy sketch challenge. 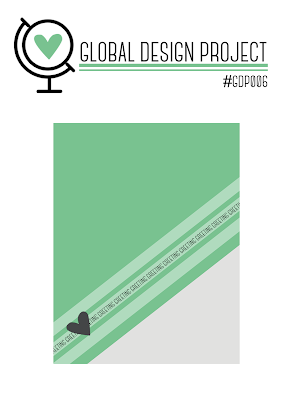 I was honoured to be asked to be a guest designer for this month's challenge. You can find more details here at A Stitch back in time blog which belongs to the head of the design team. The more I use this set, the more I like it. This time I have teamed it with the butterfly thinlits. These can be bought as a bundle in the new Occasions catalogue. If you haven't got your catalogue yet, just let me know and I will get it to you with the Sale A Bration catalogue. This card is for Matt's grandparents 65th Wedding Anniversary. The background is created by using the aqua painter and a spot of re-inker. Accessories: hemp twine, gold baker's twine and beautiful wings thinlits. I just wanted to show off the new Lotus Blossom stamp set. This is only available for a short time and is a Free Sale A Bration set, only available when you spend $90 with Stampin' Up!. Double the excitement today!! A new catalogue for all your Valentines, Easter, Mother's and Father's Day and so much more! Add to that SAB!! For every $90 you spend, you can pick a FREE item from the SAB Catalogue. Choose from stamps, papers, embellishments and so much more! Check out this link to my Online store to see all the fabulous new products and SAB items.